My friend was having difficulties getting her 7-year-old daughter up and ready for school in the mornings. After repeatedly asking her daughter to do her morning routine, she decided she had enough. She asked her daughter to come to the bathroom to fix her hair, but didn’t keep asking. Her daughter hadn’t come in to get her hair fixed by the time my friend was finished in the bathroom. When the girl wanted her hair fixed, the mom calmly told her that she had missed her chance. She didn’t follow her mom’s instructions, so she would have to go to school with her hair as it was. Hair au naturel – the natural consequence. There are natural consequences to our behavior as well. If we treat others badly, we lose friends. If we fail to pay our bills, we lose those services. But we don’t have to make every mistake to be able to learn! I applied my heart to what I observed and learned a lesson from what I saw (Proverbs 25:32). The Book of Proverbs is one of God’s ways of telling us the life choices we need to make, and it’s pretty straightforward. Seek wisdom and understanding, be honest and humble, stay away from the wicked, just to name a few. These characteristics help us avoid the natural consequences of poor choices, though we do tend to stumble at times. Beth Moore has said that she would prefer to learn by the textbook than have to learn it the hard way in life. As a parent I would like to be able to tell my children all the choices they need to make without them ever having to learn the hard way, but alas, my children will make mistakes, and they will have to suffer the consequences. God feels the same about us. He doesn’t want us to have to learn it the hard way! One bad hair day is not too terrible of a consequence, but it did the trick. 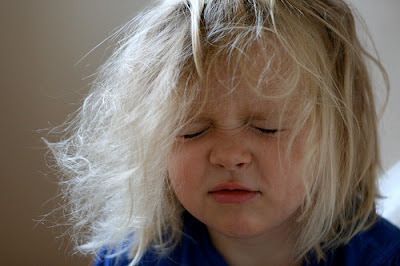 The next morning my friend’s daughter quickly got out of bed and was ready to get her hair fixed when her mom asked. Sometimes we learn by example, and sometimes we have to learn things the hard way. I think I’ll try God’s way – find a little truth and direction in Proverbs.